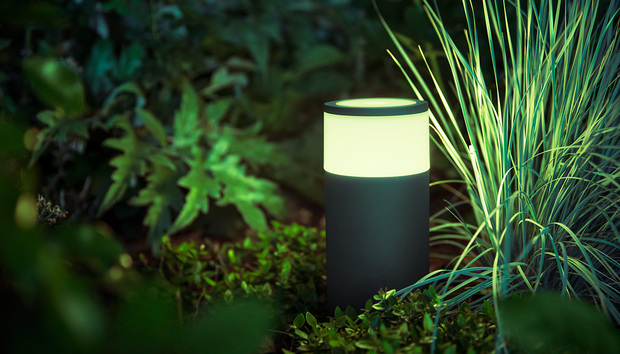 The Philips Hue Calla bollard-style light fixture, $130, costs a small fortune compared to the typical “dumb” low-voltage outdoor LED path lighting. In fact, you can buy a half dozen of the latter—as you might need to fully illuminate an entire pathway—for the price of one of the former. But the Calla offers three major advantages conventional lights don’t: You can select from 16 million shades of colored light, various temperatures of white light (warm to cool), and you can integrate it with other Philips Hue bulbs and luminaires, indoors and out. 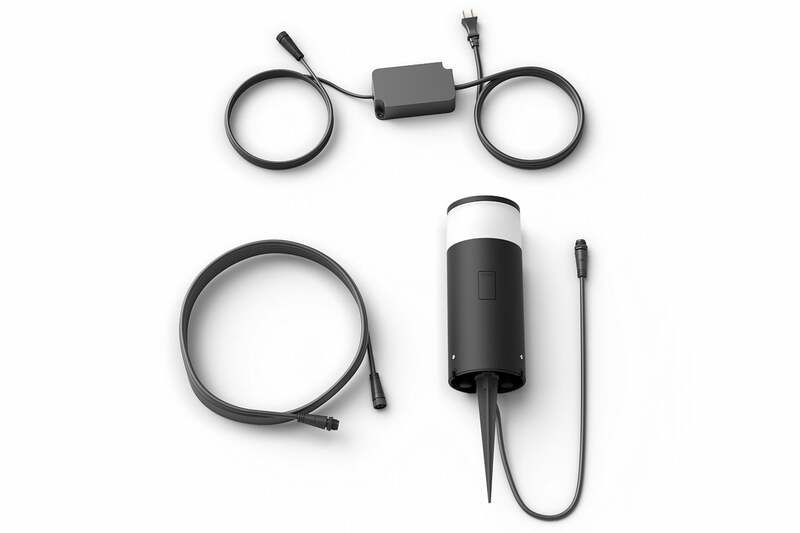 The Calla base kit includes the luminaire itself, its power supply and an extension cable, and an aluminum stake. Philips provides a sealed, in-line, low-voltage power supply with the Calla. You’ll need to plug the power supply into an outdoor outlet that’s protected by a bubble cover (it’s best that this outlet not be controlled by a switch, since shutting off power to the light defeats the purpose of deploying a smart light). The fixture itself has a stub cable with a bayonet-style connection at the end. This connects either to the longer cable emerging from the power supply or the provided 16-foot extension cable. Once you’ve set up one Calla light, you can buy up to four additional units and daisy-chain them to the same power supply. These extension kits, which come with cables and T-style electrical junctions but no power supply, cost $90 each if purchased directly from Philips Lighting. 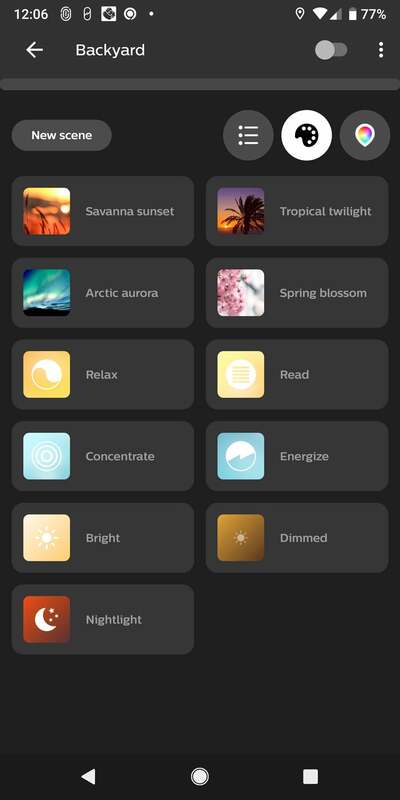 In addition to creating indoor and outdoor lighting scenes—based on brightness, color, and lighting temperature—the Hue app allows you to create routines during which the Calla will turn on and off, change colors, and so on. A “go to sleep” routine, for example, will set the light to a defined color temperature at a specified time, and then gradually fade to off over a defined time (e.g., over a 30-minute period). The Calla is an expensive outdoor fixture, especially if you need to deploy it in multiples to illuminate a long pathway. It’s not exceedingly bright, but when installed next to a walkway, it produces a pool of light that’s large enough to illuminate your way. So it’s better at adding a pleasant bit of atmosphere to your outdoor areas than anything else. Bottom line: This is a well-built luminaire that’s designed to stand up to the elements, and it ties into what is arguably the best home lighting ecosystem on the market today.